Robust design with smooth ON/OFF switching by turning the lever . Equipped with security lock. The contact surface of the magnet consists of two longitudinal poles with prism. 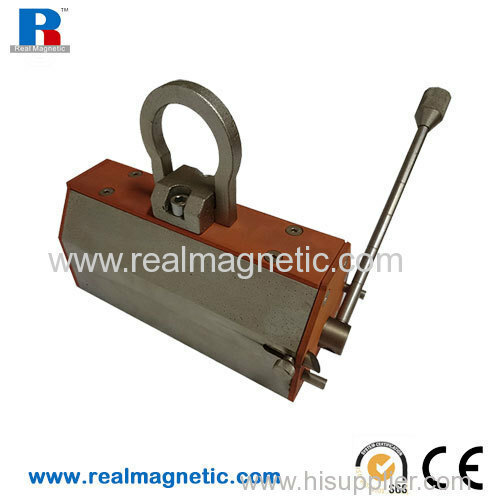 Due to the use of neodymium magnetic material these lift magnet have an enormous lifting capacity related to their size and weight. The break-away-force of e.g.. the 250 kg version is at least 60 times its own weight. The lifting magnets can easily be switched by hand in case its magnetic circuit is closed; so when the magnet is placed on the workpiece. Suitable for flat- and round material. Delivery includes certificate and operating manual.